Super soft, a lovely pink with little sparkly bits and some of the most difficult yarn I have ever knit with! 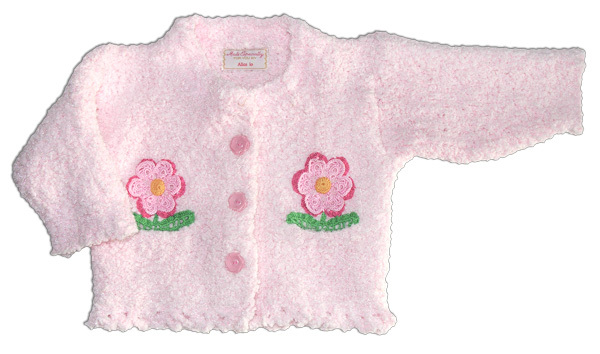 It all worked out in the end… This cute cardigan with false pockets on the front is soft, fuzzy and a lovely soft pink. The yarn turned out to be some of the most difficult I have ever work with and I ended up needing to be inventive with sewing machines and crochet hooks to finish up this knitting project. It is the fuzzy yarn that is the challenge. Those wispy bits make it very, very difficult to see your stitches or count rows, and darn near impossible to take out since they tangle and knot. As I finished up the pieces (two sleeves, two front panels and the back) it was obvious that I had lost count somewhere and now had parts that wouldn’t quite fit together as planned. Time for some creative finishing. I decided to treat each pieces as if it was a thick fabric and assemble by sewing, which allowed me to trim the pieces to fit. To keep the knitting from unraveling, and give the inside a finished look, I serged the edges. (You do have to watch that your serger doesn’t stretch the knitting. I recommend pushing on the knitting rather then relying only on the feed dogs to pull the piece through.) Ribbon was sewed along the backside of the button areas to stabilize them and button holes created on the sewing machine. I used crochet for final edge finishing including making a scalloped/lacy bottom edge. And the vintage crochet flowers were hand sewed on as decorative elements coming up out of the false pockets.